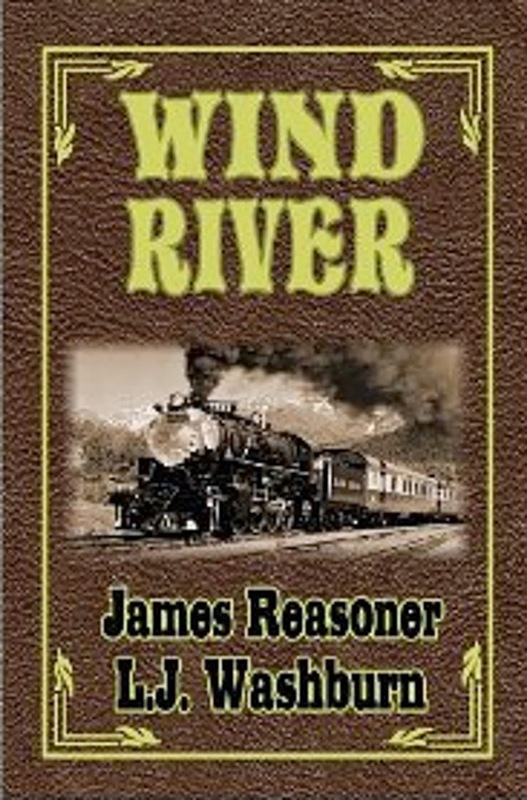 The first book in the Wind River series by Livia and myself, aptly titled WIND RIVER, is free right now for the Kindle. You can grab a copy of it here. I’ve been a Milton Caniff fan since I stumbled across a volume reprinting some of the TERRY AND THE PIRATES strip back when I was in college. 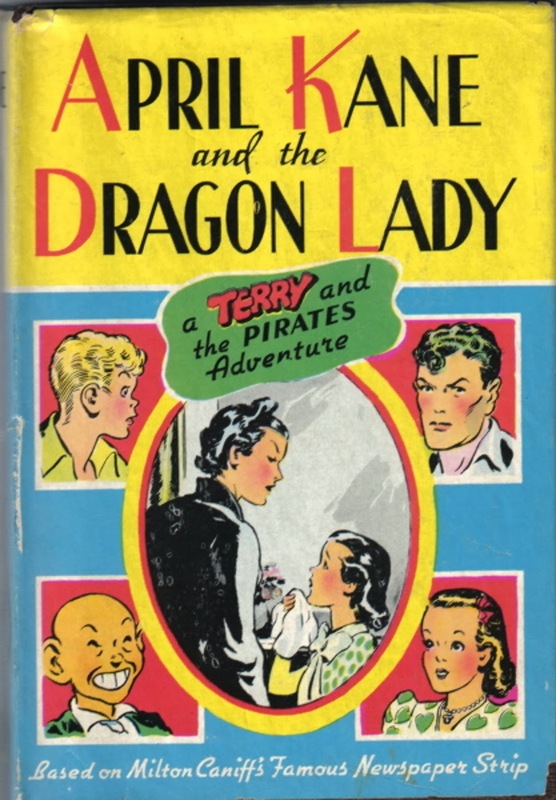 This Terry and the Pirates novel is a Whitman juvenile published in 1942, based on one of the story arcs from the comic strip originally published in 1939. 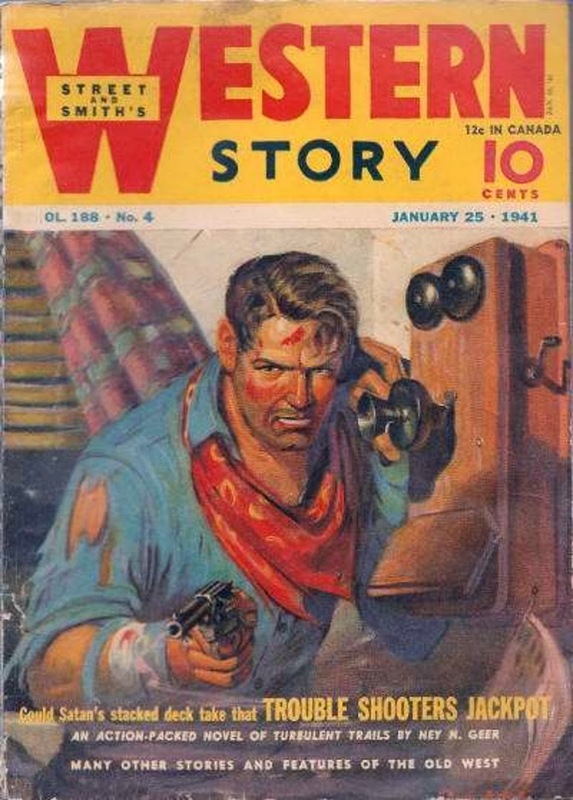 No credit is given to whoever turned the story into a novel, but it almost certainly wasn’t Caniff himself. There are numerous illustrations “adapted” from the strip, so while they’re based on Caniff’s work, they’ve apparently been redrawn and simplified somewhat, lacking a lot of Caniff’s trademark details. I'd never heard of AIN'T THEM BODIES SAINTS until it popped up on a Netflix recommendation. I'm not surprised that it didn't get much attention when it was released. It's not really designed to be a big box-office blockbuster. But that doesn't mean it isn't a pretty good film. This movie is pure redneck noir, set in Texas during what appears to be the 1970s, although the time is never specified. A young couple, Bob and Ruth (Casey Affleck and Rooney Mara) are going to have a baby and trying to make a life for themselves, but unfortunately that involves Bob participating in an armed robbery with his best friend. Things go wrong, as they always do in stories like this, and in the resulting shootout with the police, Bob's friend is killed and Ruth wounds one of the cops before they're captured. Bob takes the blame for what Ruth did, however, and he's sent off to prison for 25 years. Ruth, still pregnant, is given a place to live by the father (Keith Carradine) of the young man who was killed in the shootout with the police. I think Carradine's character may have been a criminal, too, but that part of the plot was never really clear to me. Ruth gives birth to a daughter, and over the next few years, while Bob is in prison, she develops an unlikely friendship with the very cop she wounded (Ben Foster), who doesn't know that she's the one who shot him. Clearly, Foster's character would like for that friendship to be something more. Then Bob breaks out of prison and heads back to the little Texas town they're all from so he can be reunited with Ruth and the daughter he's never seen. All of that is set up fairly quickly, and that's it for the plot, too. The rest of the movie is waiting to see whether or not Bob is going to reach his destination and what's going to happen if he does. That also gives you a hint of this movie's biggest problem: it's sloooow. Not just leisurely paced, but really, really slow. 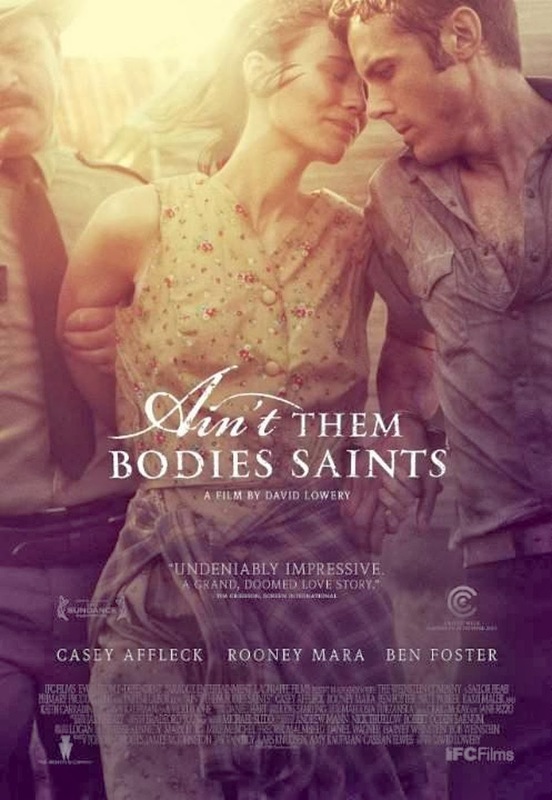 That's usually a deal-breaker for me when it comes to movies, but I'm inclined to give AIN'T THEM BODIES SAINTS a little leeway because the acting is very good all around and the dialogue is really well-written. The movie looks great, too, and does a fine job of capturing the time and place in which it's set. Someone named David Lowery wrote and directed the film, and he's definitely got some talent. It's clear he set out to make a slow burn of a suspense movie, and I can't fault him for that since he accomplished his goal. Some of the reviews I read compared this movie to Terence Malick's BADLANDS and DAYS OF HEAVEN. I can see that. I liked BADLANDS, didn't care for DAYS OF HEAVEN. And overall I liked AIN'T THEM BODIES SAINTS, too. I think it's worth watching. 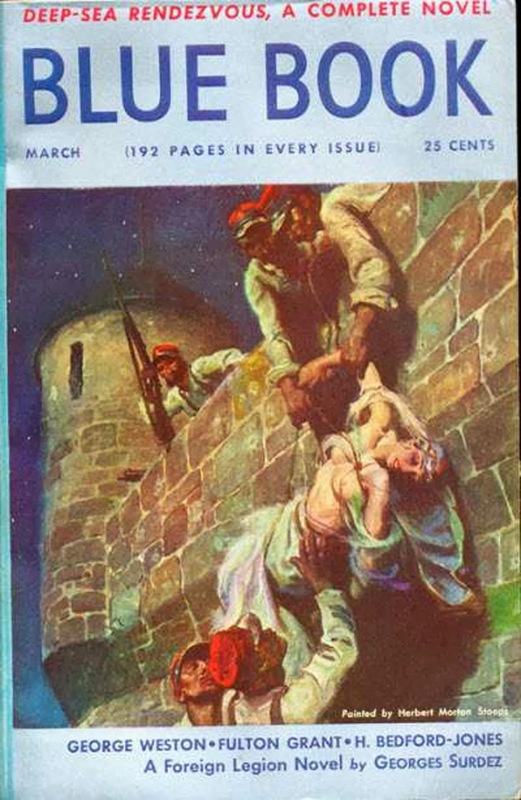 I don't know if those Legionnaires are smuggling the dancing girl into or out of the fort, but either way that's a provocative, eye-catching cover by Herbert Morton Stoops, the long-time cover artist for BLUE BOOK. 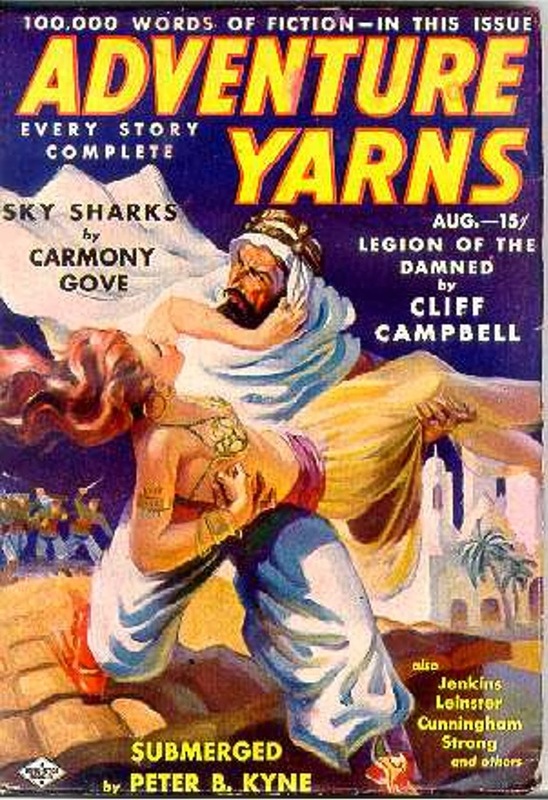 Inside this issue are stories by H. Bedford-Jones, Gordon Keyne (also H. Bedford-Jones), Michael Gallister (um, also H. Bedford-Jones), a Legion yarn by Georges Surdez, one of the best at that sub-genre, a Red Wolf of Arabia story by William J. Makin, and yarns by Fulton Grant, Kenneth Perkins, and Beatrice Grimshaw, among others. Plus interior art by Austin Briggs. 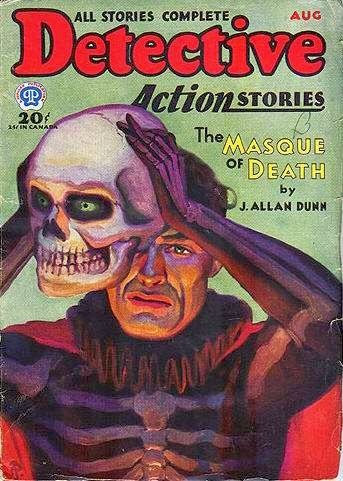 BLUE BOOK was one of the great pulps, and it was issues like this that helped earn it that reputation. It's odd the things we remember. A few days ago I drove by the strip shopping center in a neighboring town where one of my daughters took dance lessons almost 25 years ago. 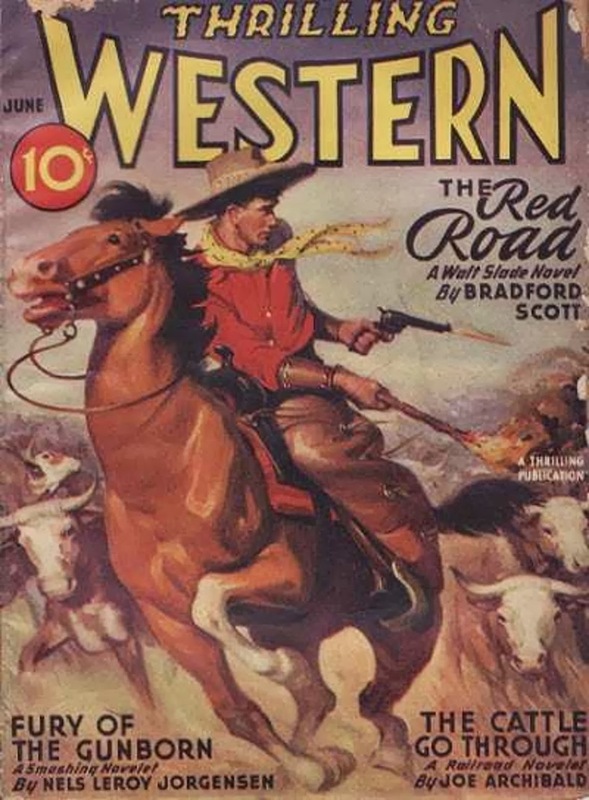 I always sat out in the car and read while she was in class, and I distinctly remember reading this issue of THRILLING WESTERN. I don't remember much about the contents, except that I liked the Walt Slade story by "Bradford Scott" (really A. Leslie Scott) and I think I enjoyed the one by Nels Leroy Jorgensen, too. But that's it. Don't recall a thing about the ones by Barry Scobee, Ben Frank, Mel Pitzer, Stephen Payne, and Joe Archibald. I got a lot of good reading done during that dance class. Our old pards Hashknife Hartley and Sleepy Stevens return in THE MYSTERY OF THE RED TRIANGLE. As usual in these novels, author W.C. Tuttle spends the first quarter of the book setting up the situation before his wandering pair of range detectives come on the scene. 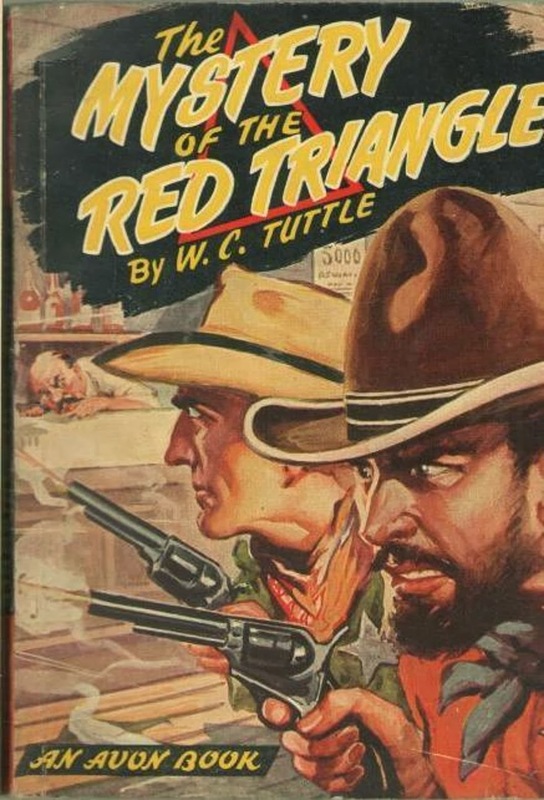 People in the cowtown of Cherokee and the surrounding area are living in fear because of the Red Triangle gang, a trio of mysterious killers who have committed several apparently senseless murders, always leaving behind a grisly calling card: a triangle drawn in the victim's own blood, either on the body or some nearby surface. This reign of terror goes back a year, and the local sheriff and deputy haven't been able to find the killers. The latest murder, that of a saloon owner who was bashed over the head and then had his safe cleaned out—and a red triangle drawn on the door—seems to represent a break in the case, however. The evidence points to Jack Dean, a wild young cowboy who's the son of an area rancher. Jack was heavily in debt to the saloonkeeper, and now he's disappeared, leading folks to think that he's gone on the run after committing the crime. This is Tuttle's cue to have Hashknife and Sleepy amble into the area. They're on the trail of a thief who stole Hashknife's horse, but they soon find themselves up to their necks in the mystery of the Red Triangle gang. As we all know, Hashknife never could resist a mystery, so he sets out to expose the killers, figure out the connection between the murders, and right all the wrongs that have been plaguing the countryside. This leads to several shootouts, a stagecoach holdup, an explosive bank robbery, and a series of double-crosses and revelations that culminate in a gathering of suspects reminiscent of what you might find in a Golden Age mystery novel, although not quite that formal. I figured out who the mastermind was before that point, but Tuttle kept me fooled for most of the novel. Nobody writes quite like Tuttle, blending complicated crime plots and hardboiled action with cornball humor, colorful characters, and a little romance. THE MYSTERY OF THE RED TRIANGLE is a little less slapsticky than some Tuttle yarns I've read, but his penchant for comic relief characters with goofy names is in full force. This can get a little old, but watching Hashknife at work more than makes up for it. 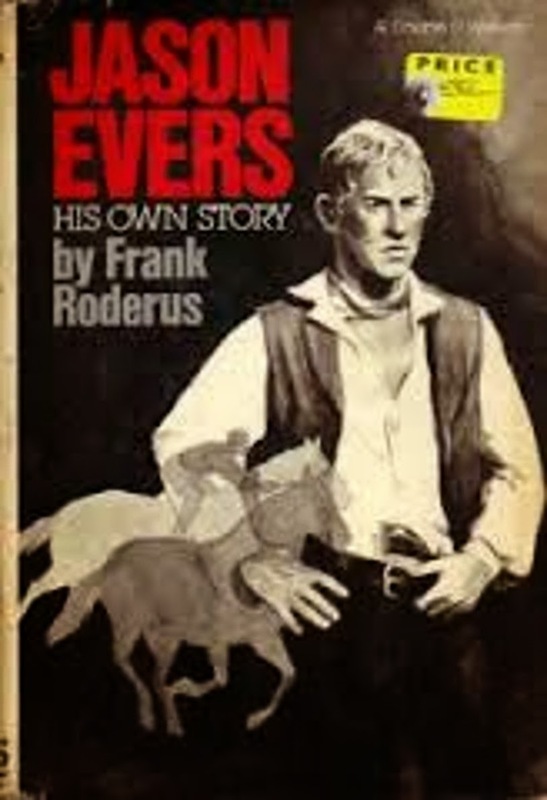 He's a frontier Mike Shayne, always two steps ahead of the other characters and three steps ahead of the reader. Sleepy is a solid supporting character, too, and the friendship and banter between them is one of the series' strong points. This novel is on the short side, which makes me think it probably appeared first in a pulp such as ADVENTURE or SHORT STORIES, two magazines where Hashknife stories showed up with some regularity. I haven't been able to locate anything to support that hunch, however. 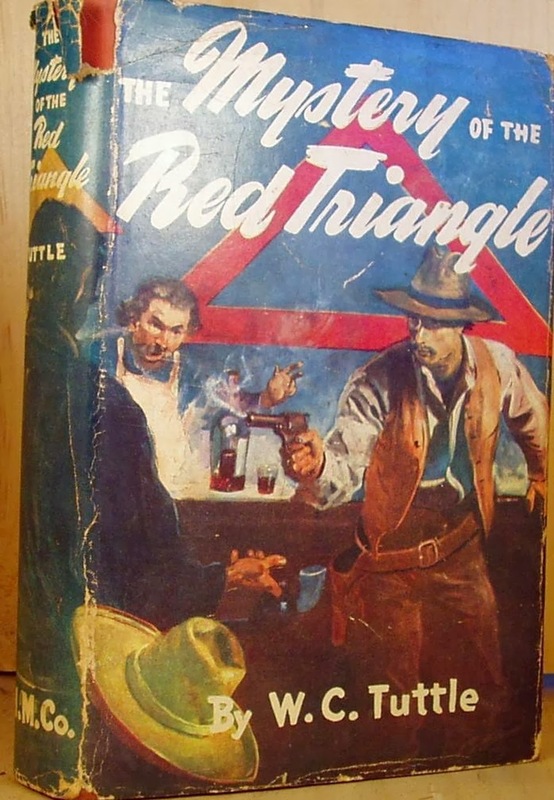 THE MYSTERY OF THE RED TRIANGLE isn't in the top rank of Hashknife novels along with such books as HIDDEN BLOOD and SHOTGUN GOLD, but it's still very entertaining and I had a great time reading it. If you're a Tuttle fan and ever come across a copy, you definitely should grab it. THE INCIDENT OF THE HARROWMOOR DOGS is the first thing I've read by Daniel Abraham, who's becoming well-known as an author of science fiction and fantasy under his own name and a couple of pseudonyms. This is a novella featuring a couple of characters who have appeared previously in some of Abraham's short stories. Balfour and Meriwether (we don't find out their first names) are a pair of tough Englishmen in the 1880s who carry out dangerous assignments for a secret intelligence agency headed by a nobleman who reports directly to the Queen. This time they're asked to track down a fellow agent who has disappeared while investigating the case of an explorer and war hero who is locked up in a sinister sanitorium after suffering a breakdown of some sort. It seems that this unfortunate patient has been having nightmares that somehow reveal information the British government would prefer to keep secret. Balfour—whose weapon of choice is knives—and Meriwether—who carries a brace of pistols and is good with them—pursue different lines of investigation that ultimately lead them to the same place, a warren of tunnels under the English countryside that contain a horrifying secret. 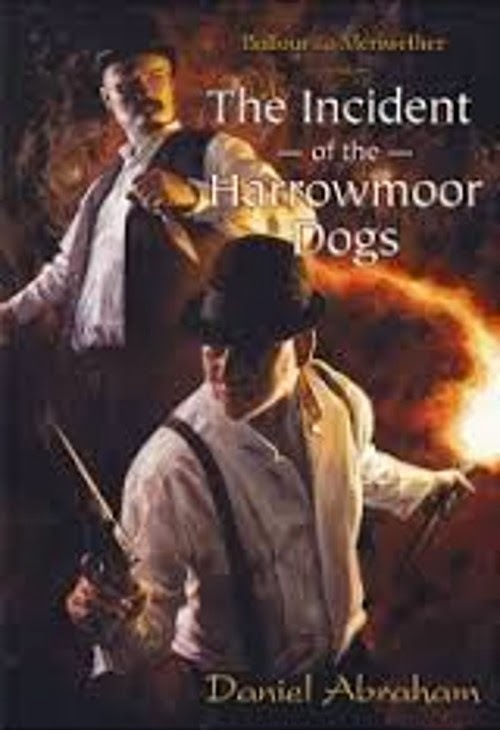 THE INCIDENT OF THE HARROWMOOR DOGS is a well-written, very entertaining blend of mystery, espionage, adventure, and horror. 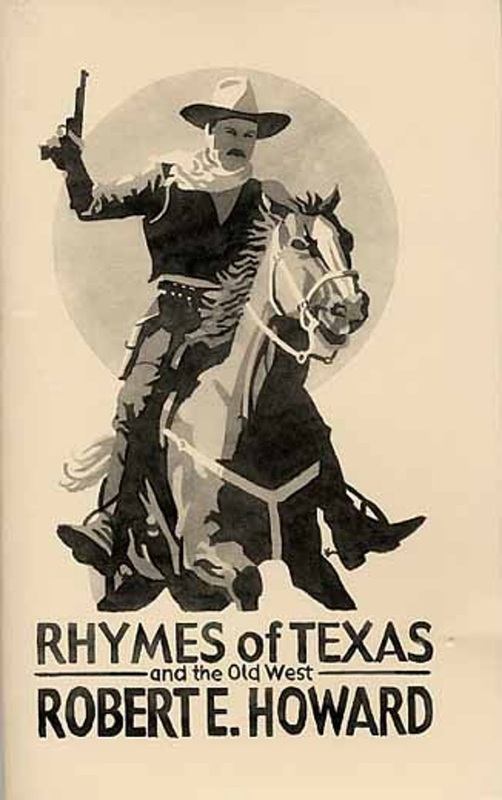 There's a little Conan Doyle, a little Robert E. Howard, even a little Robert Louis Stevenson. There's a late twist in the plot that seems a little forced to me, but hey, it's Abraham's story, not mine. And overall I had a fine time reading it. The earlier Balfour and Meriwether adventures are available here. I liked this one enough that I've already bought them and look forward to reading them. Once again I'm stretching the definition of "overlooked" to include a movie that many of you surely have seen already. Some of you probably saw it when it came out. I remember watching previews for it at the Eagle Drive-In, a quarter of a mile up the road from where I lived. But I never watched it until now. Now, I'm no Edgar Allen Poe expert. Not even close. 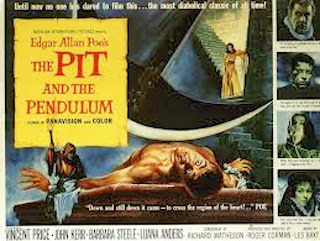 But it seems to me that the screenplay for THE PIT AND THE PENDULUM (which was written by Richard Matheson) borrows elements from several other Poe stories as well as the one from which it gets its title. Englishman Francis Barnard shows up at the Spanish castle of Don Nicholas Molina, who was married to Barnard's late sister. The sister died mysteriously, and Barnard wants to get to the truth, which proves to be a lot more complicated than it appears at first because Matheson keeps throwing in flashbacks and plot twists which culminate in a suspenseful sequence involving the infamous torture device. It's a smart little movie, creepy for the most part and grisly when it needs to be, and very briskly directed at 80 minutes by Roger Corman. Despite the budget limitations of being an American International Production, it looks good, with a mixture of stark shadows and bright colors. A movie like this really was made to be seen on a drive-in screen. I could almost hear a mosquito buzzing in my ear as I watched it. Nobody in the cast is very good except Vincent Price as Don Nicholas, but Price is wonderful. He really threw himself wholeheartedly into these parts. I think there are more of those AIP horror films I haven't seen. I'm going to have to look into that. But for now, if you somehow missed THE PIT AND THE PENDULUM like I did, you should give it a try. No new books take me back to the reading pleasures of my youth more than the Doc Savage novels by Will Murray. The latest one, PHANTOM LAGOON, is no exception. It follows the classic Doc Savage opening: someone in trouble shows up in New York looking for Doc, thinking that he's the only one who can right this particular wrong. The bad guys, fearing Doc's involvement, try to prevent that person from reaching him in his skyscraper headquarters. Violent chaos ensues, and we're off to the races. In this case, the person seeking Doc's help is beautiful blond adventuress Hornetta Hale, who is rescued from an island in the Caribbean where she's been stranded by the villains. Knowing that Doc has his own private submarine, she wants to hire it, but she won't explain why. This would be too much of a mystery for the Man of Bronze to ignore, even if the bad guys hadn't come in and practically destroyed his headquarters and the Hidalgo Trading Company warehouse where he keeps his planes, autogyro, and submersible. With help from his loyal aides, the bickering Monk and Ham, and the unwanted interference of his gorgeous cousin Pat Savage, Doc sets out to track down Hornetta Hale, whose trail which leads to tropical islands, yet another beautiful blonde, a race of sinister mermen who live under the sea, and an evil plot that could change the course of history for the entire world. As usual, Murray's prose perfectly captures the style of Lester Dent, the original author of the Doc Savage series. His books are longer and the plots more complex than was common in the pulp era, but there's nothing wrong with that. PHANTOM LAGOON speeds along to a climax that's particularly satisfying. I didn't know how Murray was going to resolve everything, but as it turns out, he couldn't have done any better. It's a perfect Doc Savage ending. I got 'way behind on this series. I've read all three of the books that came out in 2013, but there are still several earlier volumes I need to get to. That's good in a way, because every time I read one, I feel like I'm sitting on my parents' front porch again with a Bantam paperback I picked up off the spinner rack at Lester's Pharmacy or Motts' Five-and-Ten. These days, that feeling is worth a whole lot to me. 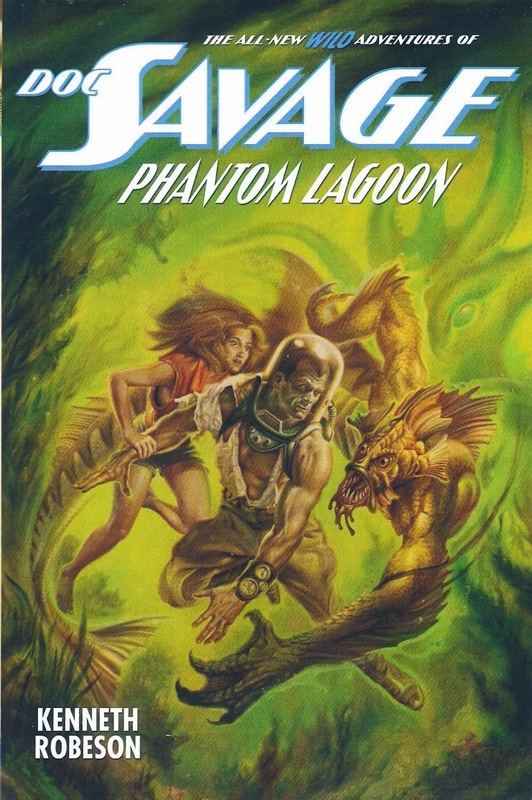 You can click on the image below to buy PHANTOM LAGOON at Amazon. There's a suitably creepy cover for you. 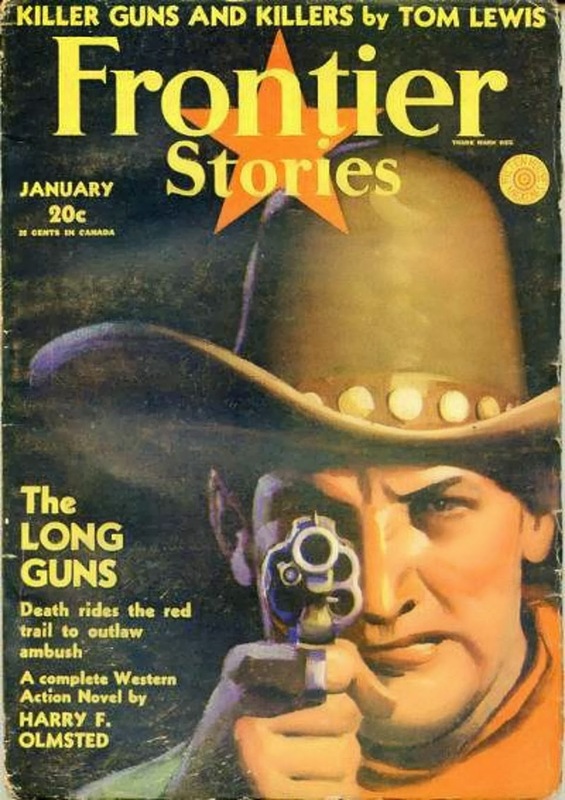 Inside the magazine, the biggest name is Erle Stanley Gardner, still a couple of years away from creating Perry Mason. Other authors include the formidable J. Allan Dunn, Edward Parrish Ware, and Leslie White. A simple but effective cover on this issue of the long-running Fiction House pulp. And an excellent group of writers inside, too, including Harry F. Olmsted, Walt Coburn, J.E. Grinstead, and Tom J. Hopkins. HEARTS AND SPURS, the second anthology of Western romance stories from Prairie Rose Publications, is now available. I've read all these stories and enjoyed them. 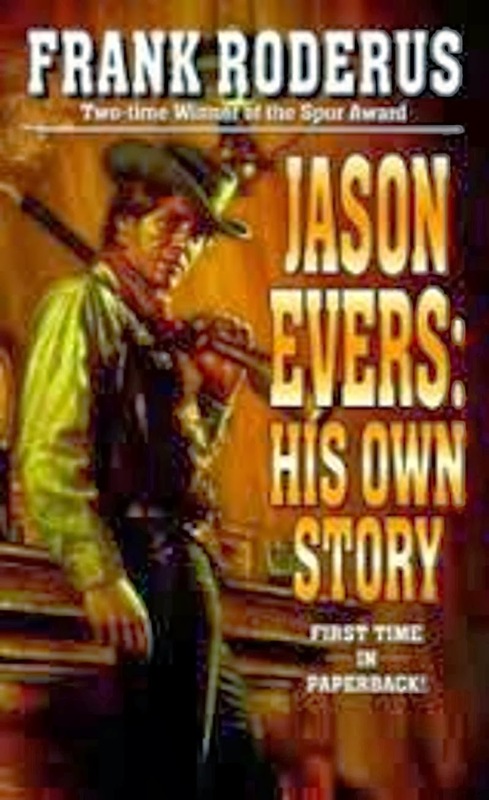 For readers like me whose interests run more toward the Western part of the genre rather than the romance, there's a considerable amount of gunplay in some of them, and some stuff even blows up pretty good. 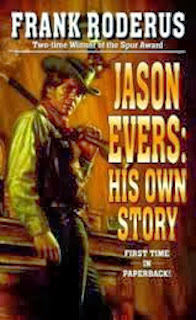 Plus a scene in one story that could have come right out of a Republic Pictures B Western. That one had me grinning when I came to it. The book is available in both Kindle and print editions, and you can find the e-book version at Barnes & Noble and Smashwords as well. I'm not quite sure how I missed so many good Westerns over the years, but here's another of them. On my list of all-time favorite actors, James Stewart lands in third place, right behind John Wayne and Humphrey Bogart. In this one he plays Mace Bishop, a drifter whose brother Dee (Dean Martin) leads an outlaw gang. When Dee and his men are captured after a botched bank robbery and sentenced to be hanged, Mace knows he has to try to rescue Dee even though he doesn't approve of his brother's life of crime. He succeeds in doing so and then accompanies the gang as they flee into Mexico with a beautiful hostage (Raquel Welch) and are pursued by a doggedly determined sheriff (George Kennedy). That's the plot of BANDOLERO! There aren't any real twists. It's just straight-ahead Western noir with plenty of action and an occasional moment of dark humor to relieve the tension. The real strength of this movie is its cast. I'd watch and enjoy Jimmy Stewart in anything. I just love to listen to him talk. I've always liked Dean Martin in Westerns, too, although I know some people don't. Kennedy is a great supporting actor, and he's not the only one. Andrew Prine does a good job as a young deputy. Will Geer, who usually played kindly old grandpas, is appropriately sinister as an outlaw in this one. 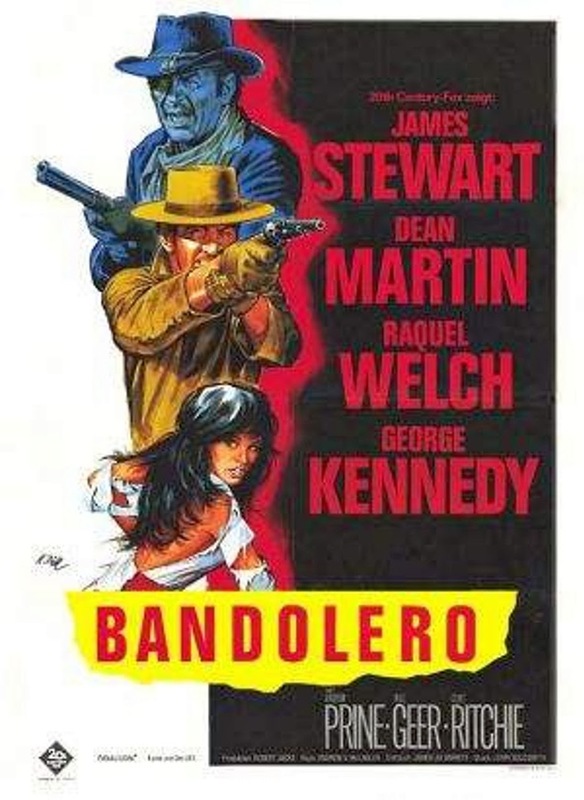 Townspeople include Denver Pyle and the iconic Republic Pictures bad guy Roy Barcroft, and one of the members of the posse is Harry Carey Jr.
BANDOLERO! was directed by Andrew McLaglen, son of the great character actor Victor McLaglen. The younger McLaglen helmed a number of John Wayne's pictures in the Sixties and Seventies, and I've always found him to be a dependable, underrated director. His films are never flashy, there's no fancy camera work, but his storytelling is excellent. There are often interesting little bits of business going on in the background if you know to look for them, and his action sequences are top-notch (assisted on this movie by legendary stunt coordinator Hal Needham). BANDOLERO! is very entertaining and certainly well worth watching. I'm glad I finally got around to it. Any book with the phrase "jungle-shrouded island" in its description on Amazon is bound to be pretty good. I think we can take that as a given. Christopher Fulbright's novella RED CHALICE certainly doesn't disappoint in that respect. It's a pulp-inspired horror/adventure yarn that's rip-roaring fun. Ex-con Layne Drover hires out for dirty jobs, and his current one fits the bill. Even though the setting is contemporary, RED CHALICE's set-up is very much like something out of a Weird Menace pulp. Layne is hired to accompany a beautiful, mysterious woman to that jungle-shrouded island I mentioned above, where the crumbling mansion of the woman's late uncle is located. She's inherited something very valuable from him, and she has to journey to the island to retrieve it. No sooner do they get there, though, than a hurricane roars in, the boat captain they hired double-crosses them, ruthless gunmen show up, and things get even weirder, bloodier, and more dangerous as Layne and his client are trapped in a labyrinth of caverns under the old mansion. The action hardly ever slows down, and when it does that's only because Fulbright has another nasty plot twist to spring on the reader. He packs a lot into this relatively short tale, and that's just the way I like 'em. 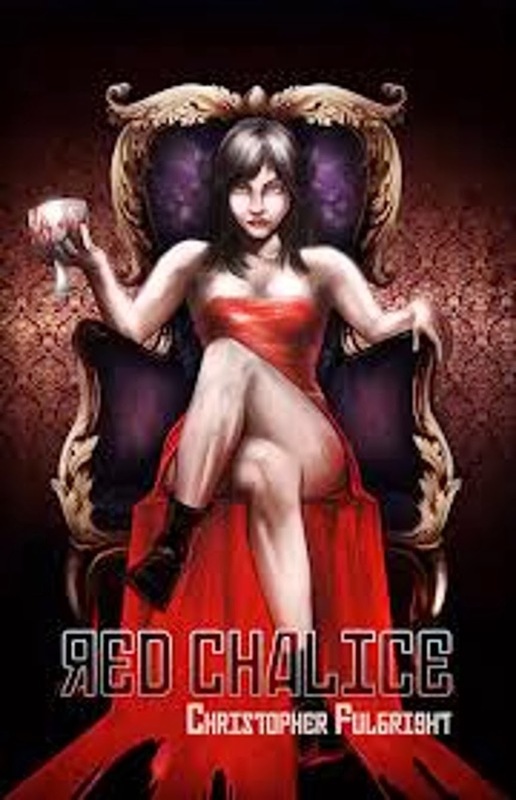 I had a great time reading RED CHALICE, and you should check it out. This pulp lasted only two issues, but it had some good authors in it. 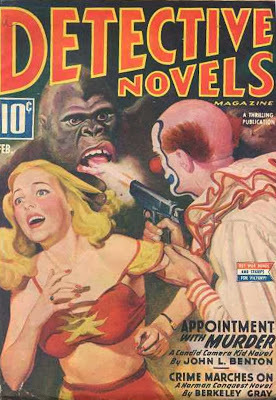 This first issue included stories by Will F. Jenkins, Murray Leinster (who was also Will F. Jenkins), Peter B. Kyne, Eugene Cunningham, Cliff Campbell (a Columbia Publications house-name) and the strikingly named Carmony Gove. A pretty good cover that serves as a reminder that telephones were around earlier than we sometimes think they were. Ray Nafziger, W. Ryerson Johnson, and Bennett Foster are the big names in this issue. The lead novel is by Ney N. Geer, an author whose work I've never read, as far as I recall, although I know I have some pulps with his stories in them. 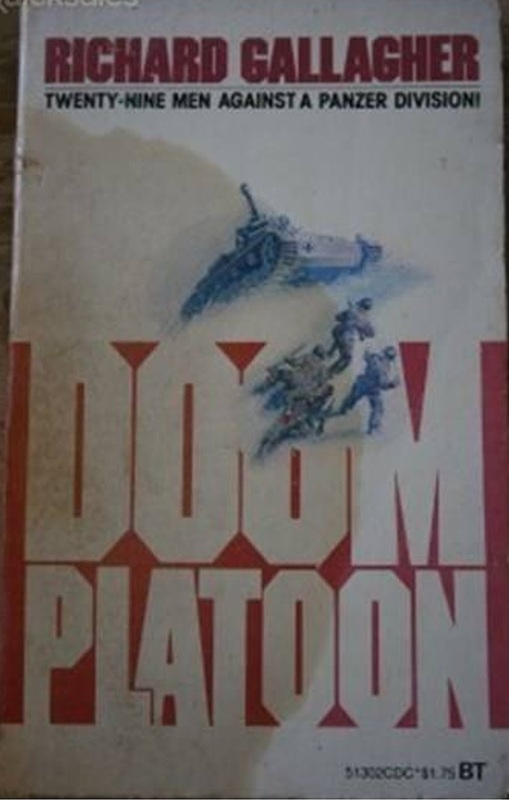 Readers of the World War II series THE SERGEANT by Gordon Davis may notice some similarities between those books and the novel DOOM PLATOON by Richard Gallagher. THE SERGEANT features a big, ugly, extremely tough non-com, Sergeant Mahoney. DOOM PLATOON features a big, ugly, extremely tough non-com, Sergeant Mazursky. Graphic violence abounds in both (although to be fair, these are war novels). There's plenty of crude, politically incorrect dark humor. None of these similarities come as any surprise when you realize that Gordon Davis and Richard Gallagher are actually the same person: veteran paperbacker Len Levinson. DOOM PLATOON came out a couple of years before THE SERGEANT began, so it can be regarded as a sort of dry run for the later series, I suppose. But it can certainly be read with enjoyment on its own. During the Battle of the Bulge, the platoon of the title is under the command of Sergeant Mazursky after their lieutenant is killed in action. These 29 men are posted on a ridge above a narrow road, and their mission is to stop an entire Panzer division from advancing and hold the road until the retreating American army can regroup. It's a suicide mission, of course, and the first half of this novel is very intense as Mazursky and his platoon try to fight off the overwhelming Nazi forces. 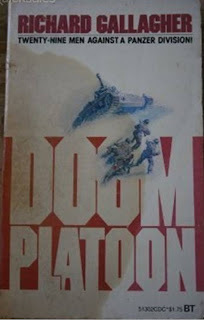 Then, halfway through, DOOM PLATOON becomes a P.O.W. novel as the survivors from the battle are taken to a German prison camp, and the rest of the book chronicles what happens to them from then until the end of the war. While this part of the book doesn't have the urgency of the first half, it's still very well done and keeps the reader flipping the pages. It's kind of a reviewer's cliché to say that prose is compulsively readable, but Levinson really does have that knack. His characters may not be particularly likable, but he makes you want to find out what's going to happen to them. This book, originally an obscure paperback from Belmont-Tower, is a good example of that. Luckily, it's just been re-issued as an e-book by Pulp Heaven, an offshoot of Picadilly Publishing. They've published several more Levinson thrillers, and I have them all on my Kindle. If you're a fan of war fiction, or if you've read THE SERGEANT or Levinson's other series THE RAT BASTARDS (about the war in the Pacific, originally published under the pseudonym John Mackie), you'll definitely want to check out DOOM PLATOON. There's been a surge in popularity for horror Westerns in recent years, and author John M. Whalen has come up with a good one in VAMPIRE SIEGE AT RIO MUERTO. The protagonist is bounty hunter Mordecai Slate, who makes his living tracking down outlaws who happen to be vampires, werewolves, and other supernatural creatures. Slate is hired by a wealthy rancher in New Mexico Territory to capture the vampire responsible for the death of the rancher's daughter. Slate manages to do that, but as he tries to return the prisoner to his employer, the vampire's brother and the rest of their gang are on Slate's trail. 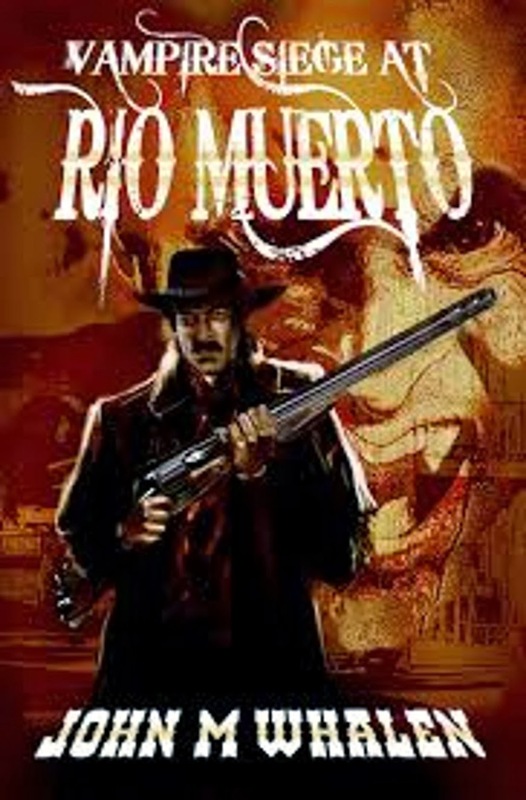 Then he runs into an unwanted complication in the form of a beautiful blonde with troubles of her own, and they all wind up stuck in the little settlement of Rio Verde, which has been renamed Rio Muerto because it's turning into a ghost town. By this time there's a small army of vampires after Slate, which leads up to an epic showdown. Whalen has created a fine protagonist in Mordecai Slate, and his other characters are interesting, too. There's plenty of well-written action and considerable suspense. Whalen does a good job blending the Western and horror elements. One thing I found surprisingly effective is that there's not a lot of elaborate world-building to explain why vampires and other supernatural beings are roaming the Old West. They simply are, and people accept that, and that matter-of-fact attitude lends a hardboiled edge to the tale. VAMPIRE SIEGE AT RIO MUERTO is a really entertaining novel. Horror fans should enjoy it, and if you're a Western reader who doesn't mind supernatural elements, you should definitely check it out as well. I read 2 books by 'way too many authors to list. I've never been the type to go on a binge and read a bunch of books by the same author, though. 5 or 6 is usually the most I'll read by the same author in one year. The most important thing is that I read a bunch of good books last year. My plan is to do that this year, too. I missed the comic book series on which this movie is based, and I didn't see the film version which came out several years ago until now. As I recall it didn't make much of a splash, which qualifies it as overlooked as far as I'm concerned because I thought it was pretty good. 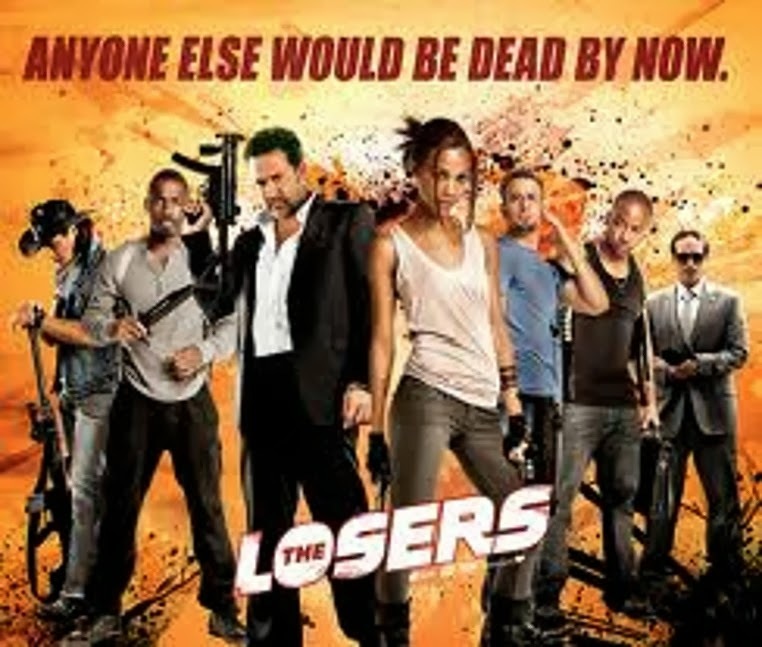 As the movie opens, The Losers aren't really losers at all. They're an elite team of Special Forces operatives (I think; their official designation isn't really clear) about to take out a jungle fortress belonging to a drug overlord. But things go bad, they're double-crossed by their CIA handler, and everybody thinks they're dead. Actually, though, they've escaped, and they want revenge on the man who betrayed them. They're contacted by a beautiful, mysterious woman whose agenda seems to coincide with theirs, and when she offers to hire them, they're willing to go along with it. From there, lots of stuff Blows Up Real Good, there are numerous plot twists and more double-crosses, and over-the-top action scenes abound. THE LOSERS bears a definite resemblance to THE EXPENDABLES, although it's not as bloody, the plot is slightly more realistic, and there are no big names in the cast, just solid actors like Jeffrey Dean Morgan, Idris Elba, and Chris Evans. The script also features a lot of tongue-in-cheek humor that had me laughing out loud a few times. I was also pleased to see a mention in the credits of Andy Diggle, the creator and author of the comic book series, and the artist Jock, rather than the usual "Based on comics published by Vertigo/DC Comics" or some such. I'm always glad to see the actual creators get some credit, not just the corporation. THE LOSERS is a pretty entertaining film. If you like action movies and haven't seen it yet, you might want to give a try. 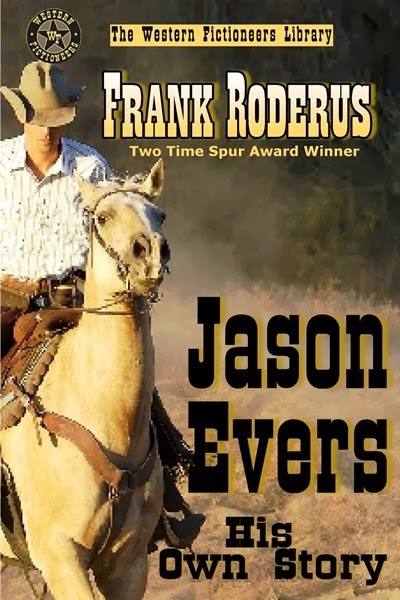 The Western Fictioneers Library reprint of Frank Roderus's great Western noir novel JASON EVERS: HIS OWN STORY is now available from Amazon, Barnes & Noble, and Smashwords. As I mentioned the other day, this is a great yarn that will really keep you turning the pages. Check it out if you're a fan of fine Westerns. A gun-toting clown, a gorilla, and a blonde in a skimpy outfit...what more does a pulp cover need, anyway? Inside this eye-catching issue of DETECTIVE NOVELS is a Candid Camera Kid yarn by Norman Daniels (a pretty good series; I've read several installments from it), a Norman Conquest story by Berkeley Gray reprinted from the British magazine THE THRILLER, and some assorted short stories. Somebody needs to do a complete collection of the Candid Camera Kid stories. I wouldn't be surprised to see that one of these days. I have a real fondness for WILD WEST WEEKLY from the mid-Thirties up until it ended in 1943, when it seems to me it was aimed less at a juvenile audience and was more of a standard Western pulp. The series characters weren't gone completely, but a lot of the stories were stand-alones. 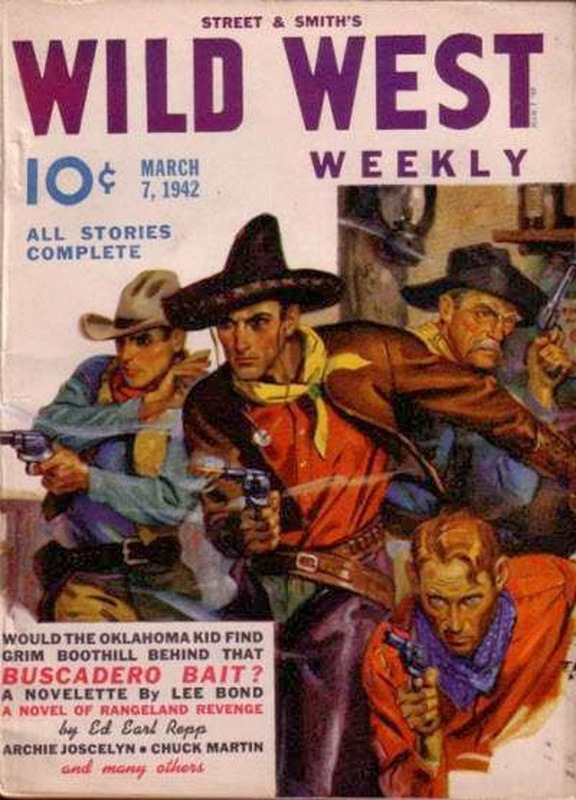 The only series character in this issue is Lee Bond's The Oklahoma Kid. I don't think I've read any of those, but I like Bond's work overall. This issue also has stories by Gunnison Steele, Chuck Martin, Ed Earl Repp, and Archie Joscelyn. I'll bet that's good readin'!